3. We accept payment by bank transfer or cheque but funds must be cleared 8 weeks prior to arrival date. Lazy Days, 101 Waterside, is our 38’ by 20’ platinum lodge and family holiday home. 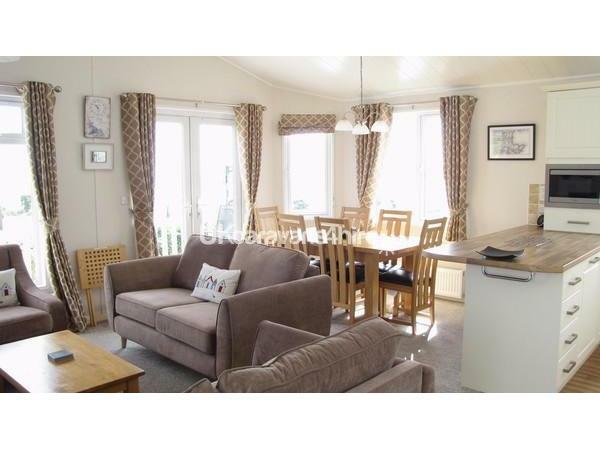 It is a contemporary holiday home, large luxurious, light and airy, with everything you need for a fantastic holiday. The uninterrupted coastal views are amazing, whether you are interested in boats, water sports, wildlife or steam trains, you can see them all as you look out over Torbay. It is double glazed with central heating throughout, so whatever time of year you take your holiday you will be able to relax in comfort and enjoy the scenery; and it is only a short walk to the beach! As private owners we maintain our lodge to the highest possible standards. It is one of the few privately rented three bed holiday homes on Waterside. There is plenty of room for you to relax and unwind so it is an ideal holiday home for a short break with friends or a family holiday. Lounge-Dining-Kitchen - Lazy Days has a spacious open plan lounge-dining area with two sofas, an arm chair and a coffee table providing comfortable seating for up to six people. A 32” full HD TV with Free View, DVD player and radio with MP3 docking station are available for your entertainment. There is a well-proportioned extendable dining table with six stylish high backed dining chairs. For cooler evenings there is an electric feature fire. The kitchen area has an integrated fridge/freezer, full sized oven and hob, microwave, kettle, dishwasher, and toaster. It is fully equipped with all the cooking utensils and crockery that you will need to prepare a snack or a three course meal. Wine and champagne glasses for that special occasion are also provided. The lounge has patio doors and windows offering panoramic views of the sea and coastline. 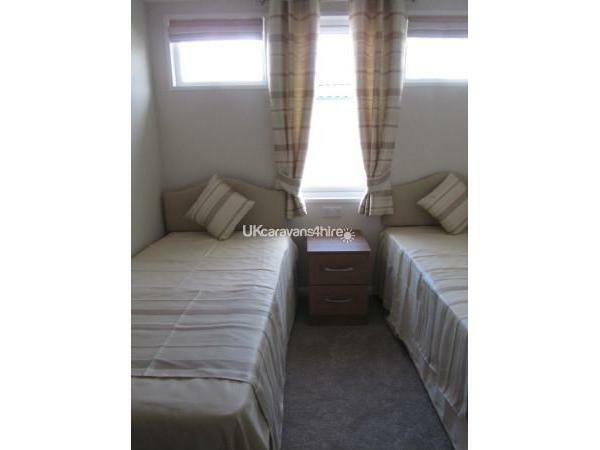 Bedrooms and Bathrooms - The master bedroom has a double bed with en-suite shower, wash basin and toilet. A large built in wardrobe and two bedside cabinets provide ample storage space. There is a bedside lamp and clock radio. The second and third bedrooms each have two full size single beds, large enough for teenagers or adult friends, plenty of wardrobe storage space and a single bedside cabinet. Each room has a bedside lamp. The spacious family bathroom has a Jacuzzi bath with shower over, wash basin and toilet. We supply duvets and pillows for up to six persons. Please supply your own towels and tea towels. Bed linen is available from the park at extra cost. Outside Deck - There is easy access to the lodge via a few steps. The custom-built raised decking is gated, ideal if you have young children, and has a glass topped table and metal chairs – perfect for watching the lights of Torbay at night, relaxing, sun bathing and watching the world and the Paignton to Dartmouth steam railway trains pass by. Utilities- The price is inclusive of all water, gas and electricity. The lodge is double glazed and centrally heated. There are plenty of marked car parking spaces on site. Parking is on a ‘first come, first served’ basis, so park wherever you choose. Duvets and pillows are provided. Please provide your own towels, tea towels, duvet covers, sheets, and pillowcases. If you prefer duvet covers, sheets, and pillowcases are available from the park at extra cost.. Staying at Lazy Days is a chance for the whole family to spend quality time together having fun. You can expect great value and clean and comfortable accommodation in this Platinum grade luxury holiday home. PRICES RANGE from £380 to £1150 per week. 4. A fully refundable £100 Security Deposit will apply to all bookings and is payable with the final payment. It is refundable after checks to the lodge have been made and found to be satisfactory. Please submit an email request for the dates you would like to book. Why not book early and get the dates you would like. If you do not want to do any cooking there are many places to eat located a short walk away and half board/breakfast only meal options are available from the Park. Please note that the lodge is not suitable for wheelchair users. Outside Waterside - The local bus route runs along the top of Waterside Holiday Park making sight seeing and touring easily accessible. Waterside is within a few minutes of the holiday seaside resorts of Paignton and Goodrington - by bus, car and even walking. There are walks along the Coastal Path. Many beaches, both sandy and with rock pools, are within walking distance. The Paignton & Dartmouth heritage railway steam trains run between Paignton and Kingswear, where you can take the ferry across to Dartmouth. As it is in the heart of the English Riviera, there are many places to explore and visit to make your holiday a memorable one. Don’t forget to bring your camera and binoculars. 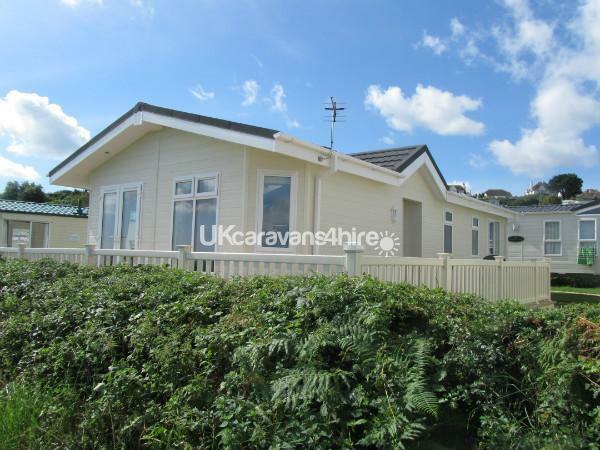 Additional Info: Waterside Holiday Park - Situated in the glorious Devon countryside, Waterside Holiday Park is a first class location for your family’s holiday. 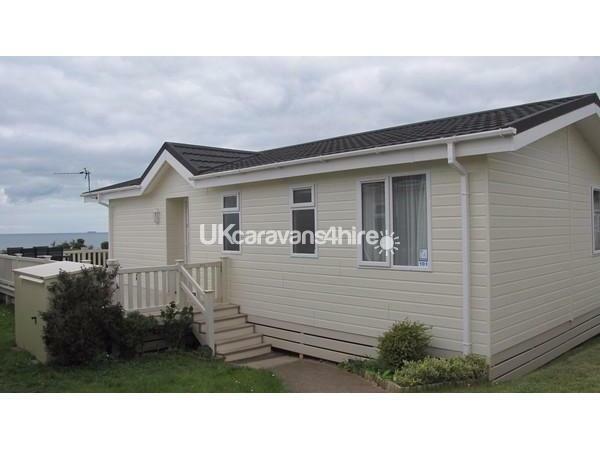 If it’s a beach location or tranquil quiet destination you’re looking for, Waterside Holiday Park has it all. Situated between Torquay and Brixham in Paignton on the South Devon coast Waterside Holiday Park enjoys the climate and attractions that have made this area the ‘English Riviera’. Set in a valley shaped hollow with stunning coastal views. the clear blue sea and mild climate offer exactly what you would expect from the delightful English Riviera. Waterside Holiday Park has a clear focus on family fun; you will certainly never be short of things to do. There is a Kid’s Club to keep little ones entertained. Smugglers Inn and Restaurant provides a variety of meals to eat in or takeaway. Entertainment evenings are provided in the Yacht Club. If you fancy a restful day between visits to the numerous tourist attractions in the area, you can relax by or in the good sized outdoor heated pool with terrace. With family friendly opening times, you can splash about with the kids or simply soak up the sun. We DO NOT provide entertainment passes for our guests. Passes can be purchased (under 3's free) at reception on arrival. Entertainment shows run each season from March to October. We as a family love the lodge which gives you a fantastic view of torbay which never loses its beauty and appeal. This being our second year and fourth holiday in the lodge and have booked for two more holidays next year says something about the lodge being just perfect. We stayed in this lovely lodge for the first time and we were not disappointed at all!! We loved the location with the added bonus of the steam train which we had to wait until 10 before we went out lol. The caravan is packed full of the everyday essentials. For all we do have older children who seem to think they need WiFi! This wasn’t missed to be honest as we were able to enjoy a lovely family holiday without that distraction. Pat and Roger kept in touch before our holiday and the communication was great. Many thanks and we hope to visit again. We are just back from our 6th visit to this wonderful lodge. We had a fantastic stay. Everything is still amazing and the same high standards have been maintained by the owners since day one. It is so popular that early booking is recommended. Definitely a 10 out of 10 holiday home with stunning views across Torbay. We return every year to Lazy days as since our first visit no other caravans can compare! It has everything you could possibly need, the owners have thought of everything and then some added bits for luxury. The views are absolutely amazing, the beds are comfortable and every single time we stay it's spotlessly clean, the owners update everything to ensure that nothing gets worn out or tired leaving everything looking new and fresh. The location of lazy days is ideal, walks either side to the beaches, great bus service or a short drive to all the local attractions. Highly recommend Lazy days to anyone. We have been going to the site for 28 years and this is the best accommodation we have stayed in this makes our holiday better than ever. The owners and cleaners have been very help full in accommodating us regarding an elderly member of the family. Looking forward to going back next year. Well 2017 was the 5th visit to "Lazy Days" Lodge and the place is just as stunning as the 1st visit. It really is a home from home. Everything in the lodge is what you would want if you were at home.... Fitted Kitchen with Oven, Cooker, Microwave, Dishwasher & Fridge/Freezer. In the lounge area there is a comfortable 3 Piece Suite, Widescreen TV and a DVD player plus a fire in case you get chilly in the cooler months. There is also Central Heating (if needed) throughout the lodge. The en-suite in the Master bedroom is a godsend as it saved any queuing for the shower or toilet in the mornings (HaHa).The main bathroom even has a Jacuzzi bath with a shower over it too!!! We've already booked our 6th visit for 2018. Pat & Rodger are fantastic owners with good communications. The setting is peaceful and idyllic, so if your idea of a holiday is to just sit and do nothing apart from relax all week then this place wont disappoint. 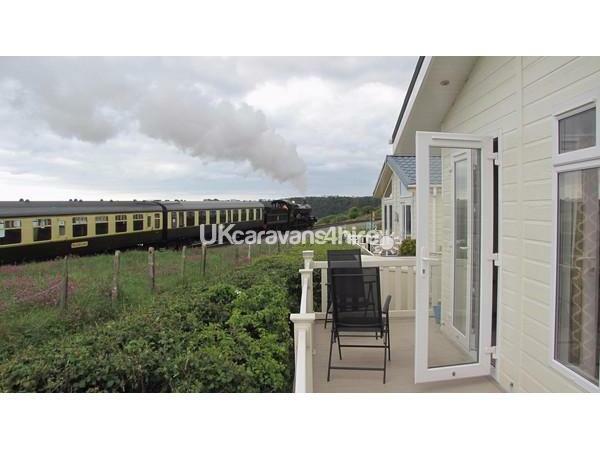 The only thing that breaks the silence is the lovely steam train that passes by the lodge as it runs between Paignton and Kingswear. If you give the passengers a wave, they normally wave back too!!! If you want to explore other parts of the Torbay area but you don't fancy taking the car and hunting for parking spaces, then only a short walk to the main entrance of the holiday park will allow you to catch the No12 bus service. Its run by Stagecoach and passes in both directions either to Brixham or towards Paignton, Torquay and Newton Abbot approximately every 10 minutes. After a day of exploring, its just heavenly to be able to sit out on the decked area, rest your feet and relax while having an ice cold drink. All in all, one word can describe the "Lazy Days" Lodge, and that word is..... Perfect. We have just spent a wonderful week at Waterside with fantastic weather. The lodge was lovely, spacious and very comfortable with everything you need, it was like home from home. Views were amazing over the bay with the passing steam train. 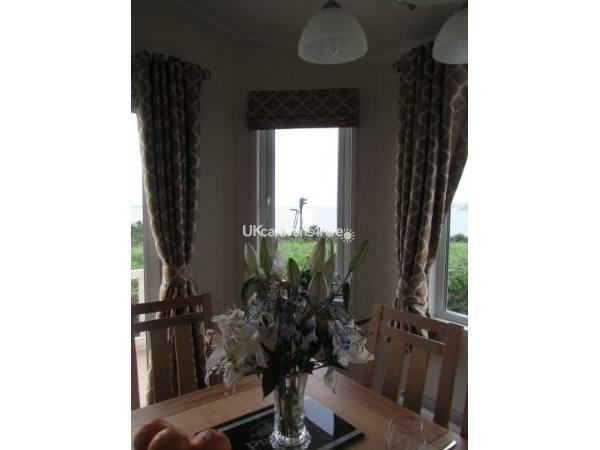 It is ideally situated for coastal walks and local transport is excellent. We would certainly recommend staying here and look forward to returning again in the future. When I originally tried to book Lazy Days it was already booked out, but Pat and Roger took the time to telephone me when they received a cancellation! This gave a great first impression and fantastic service. The lodge is exactly as all the other reviews say - perfect, ideal, spacious etc. The only think it lacks is WIFI and, travelling with three teenagers, has caused some extra expense on our phone bills! The views on a clear day are spectacular. The lodge is very well equipped and having two bathrooms is well laid out. We would certainly recommend it. Well June 2016 was our 4th visit to the lodge and it is just as great as it was on our 1st visit. "Lazy Days" has a nice decked area to the side and around the front of the lodge along with a patio table and chairs. From the front of the decked area you can see out across the whole of Torbay with Torquay on the left and over to Brixham on the right. The Steam Railway that runs from Paignton to Kingswear passes the lodge a few times during the day and a lot of people on the train normally give you a wave as it goes past. 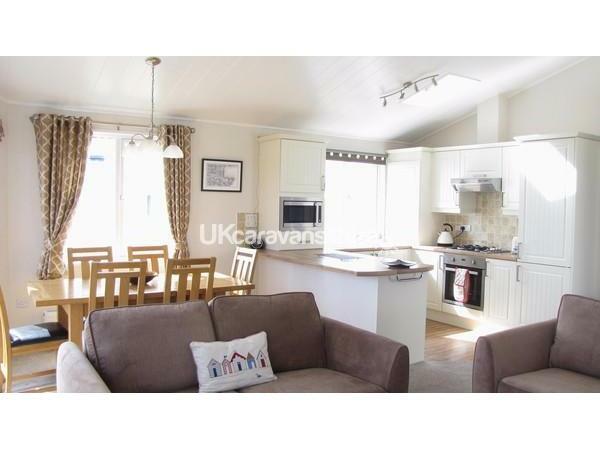 The inside of the lodge has a large open plan area with a lounge, dining area and kitchen. The lounge area has a leather 3 piece suite (armchair, 2 seater & 3 seater) with a widescreen TV plus a separate DVD player in case you don't fancy watching any of the tv programmes (bring your own DVD's to watch). The dining area has a nice sturdy table with 6 chairs and full height/patio doors that open out onto the decked area at the front of the lodge. The fitted kitchen area has got a tall fridge/freezer, cooker, toaster, microwave and even a dishwasher!!! There are plenty of storage cupboards and utensils, pots, pans, crockery, cups and glasses etc. The main bathroom has a toilet, basin unit and a bath containing a Jacuzzi plus a shower fitted over one end of the bath. There are 3 bedrooms in the lodge.... 2 are twin bedrooms with full size single beds and plenty of storage in the sliding wardrobes and bedside cabinets. The 3rd bedroom is the master bedroom which has a full size double bed plus sliding wardrobe and bedside cabinets. The master bedroom also has an en-suite toilet, basin unit and corner shower. Pat & Rodger are always so easy to deal with from start to finish. I don't think you will get a better view and the lodge is amazing. 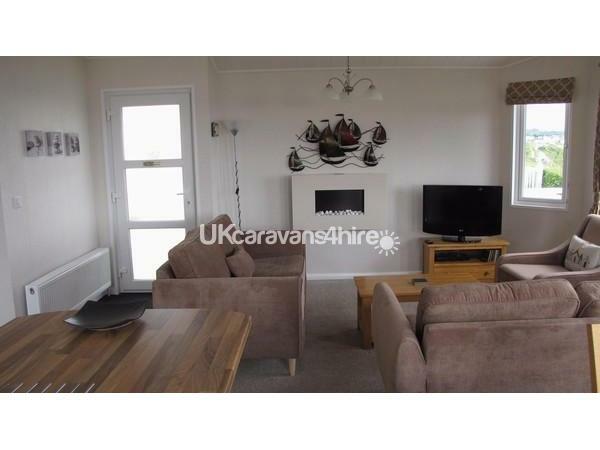 This is the first time staying in this holiday home and it won't be our last,we are already looking to book next year.It is very well situated with excellent accommodation and a very well equipped kitchen something you don't always find.Very clean comfortable accommodation..Booking is very easy and straight forward. Another brilliant holiday thanks Roger and Pat. Lazy days remains a very high quality well equipped accommodation, we are looking forward to returning again next year. Just returned from spending a week at Lazy Days with my family. I have to say that I am not aware of a more idealic setting for a holiday anywhere else in the UK. The lodge is first class, it is clean, modern and extremely spacious.. The living area has a very comfortable 3 piece leather suite and 42" LED TV. The kitchen is spotless and has all the mod cons including a dishwasher and built in microwave. All three bedrooms are spacious with built in wardrobes, the master also has an en-suite attached. The bathroom has the most beautiful relaxing jacuzzi bath ever, something I now need to get at home. The neighbours on both sides whom are both residential are lovely and certainly enhance the holiday experience. The outside decking area is large and has a table and six chairs for outdoor eating. The view is absolutely breathtaking and in my mind is the main highlight of what has been a wonderful week. There is plenty of places to visit for both young and old, you will have no reason to be bored. I can not recommend this lodge enough for anyone considering booking, go ahead, you will not be disappointed. What a fantastic place this is. This was our second visit to the lodge and it is just an amazing holiday home. There is a lovely decked area to the side and across the front of the lodge along with a wooden patio table with 6 chairs. 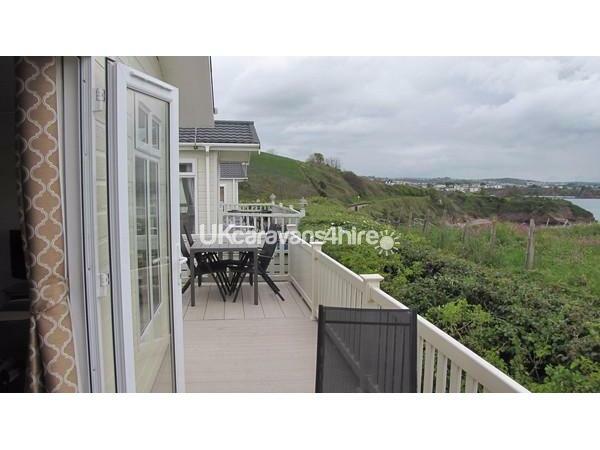 The decked area also looks out across the whole of Torbay where you can see over to Torquay on the left and across to Brixham on the right. The Paignton to Dartmouth Steam Railway passes the lodge a few times during the day and lots of people on the train (including the engine driver) normally give you a wave as it goes past, which just adds to the relaxed atmosphere of your holiday experience. Inside the lodge there is a large open plan area with a lounge, dining area and kitchen. The lounge area has a very comfortable 3 piece suite with a widescreen TV and also a DVD player for those times when you don't fancy going out and just want to relax. The dining area has a nice sturdy table with 6 chairs and full height/patio doors that open out onto the decked area. The fitted kitchen has a microwave, dishwasher, toaster, cooker, large fridge/freezer and plenty of storage cupboards. There are plenty of utensils, pots, pans, crockery, cups and glasses etc. The open plan design means that nobody is separated from anyone else in the family if you are cooking, watching TV or sitting at the table. The main bathroom has a toilet, basin unit and a bath containing a Jacuzzi plus a shower fitted over one end of the bath with a folding glass screen. There are 2 twin bedrooms with full size single beds, along with plenty of storage in the sliding wardrobes and bedside cabinets. The master bedroom also has a sliding wardrobe and bedside cabinets plus a double bed. There is an en-suite toilet, basin unit and corner shower. Pat & Rodger are so easy to deal with from start to finish. We have already re-booked for another holiday at the lodge in 2015. So if you want to really treat yourself to something special without it costing a fortune then "Lazy Days" lodge is the place for you. All in all, I don't think you will get a better holiday home with such an amazing view. We had the best family holiday ever. 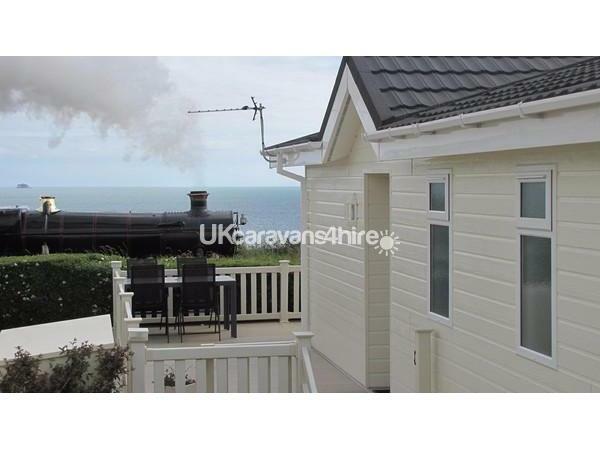 The lodge is a beautiful, homely, cosy place to stay with the added benefits of the steam train passing by each day and the outstanding sea views. Breath-taking! even at night with the lights across the bay from Torquay across the water to brixham. We enjoyed watching, seated comfortably on the lodge decking, the stunning firework display at Paignton. Pam and Rodger have been excellent in communications and even left us a surprise wedding gift, which was a very thoughtful gesture and special touch. (Thank you again). We didn't want to leave such a gorgeous place so we have rebooked for next year but for two weeks instead of one. Can't wait!!! We have already recommended family and friends to take a look at the website. Wow - what an amazing lodge and stunning views over torbay - this was our second stay in lazy days and we still love it. The lodge has everything you need to make your stay very comfortable. The kitchen is well catered for with trays and pots and enough cutlery and plates etc to cater for a large group an added bonus too is the dishwasher and large fridge/freezer! The open plan living area is lovely as you don't feel separated and left out if your cooking - there is also a large TV with a dvd player - a real home from home! Our daughter loved the fact the steam train passes numerous times a day - its a real pleasure watching it climb the hill and pass the lodge from the large decking. 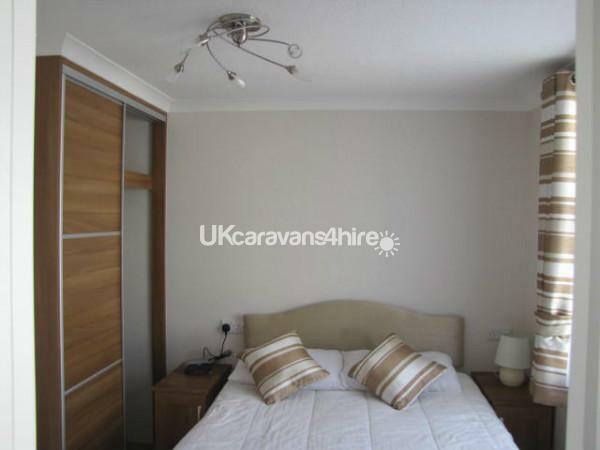 The bedrooms are of a very good size and the beds are very comfy too. The main family bathroom is a firm favourite with the Jacuzzi bath! Overall the lodge offers a great base for your family holiday. Its clean, well cared and loved for. Pat and Rodger are a pleasure to deal with and made sure everything was ok before and after we went. We are looking forward already to our next visit.